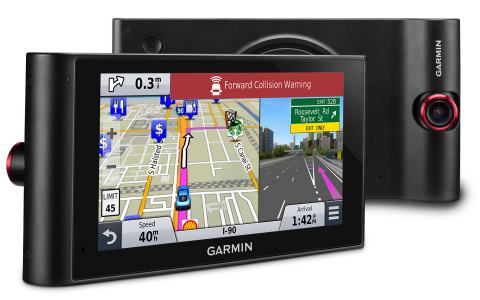 Garmin International Inc., announced nüviCam LMTHD, the portable navigation device (PND) to feature a built-in dash cam and advanced alerts to enhance driver awareness on the road. The nüviCam offers the premium driver-assist features typically found only in luxury vehicles. For example, Forward Collision Warning alerts drivers if they’re driving too close to the car ahead; Lane Departure Warning alerts will appear and sound if the driver drifts off the road or into oncoming traffic; and Garmin Real Vision™ takes the guess work out of deciphering hard-to-see house numbers by displaying the camera view along with a bright arrow to direct drivers where to go when approaching select destinations. The nüviCam features a 6-inch pinch-to-zoom glass display with a high-definition dash cam built in to the back of the device. When powered on, the integrated dash cam continuously records on the included microSD card, and if an incident occurs, the device’s Incident Detection will automatically save files on impact. GPS records exactly where and when events occur, and drivers can play back the video on the device or watch later from a computer. There’s also a Snapshot feature on the nüviCam that allows drivers to capture still images in or outside of the vehicle if desired. The included magnetic mount enables the device to be easily and quickly secured or removed from the vehicle. Other navigation features offered with safety and convenience in mind include voice-activated navigation that allows drivers to speak commands to the device while their hands stay safely on the wheel, and Bluetooth® wireless technology for hands-free calling (requires Bluetooth-enabled smartphone sold separately). Smartphone Link, a free mobile app that connects nüviCam with a compatible iPhone® or Android™ smartphone, can also provide real-time data services, such as live weather radar, to the navigator. Drivers can even pair the nüviCam with the Garmin BC™ 30 Wireless Backup Camera (sold separately) to see what’s behind their vehicle when they reverse. The nüviCam comes preloaded with detailed maps of North America and free lifetime map updates are included to ensure the most up-to-date maps, points of interest and navigation information is available. This navigator also features HD Digital Traffic4, the best and fastest traffic solution available from Garmin, for the useful life of the device. The Garmin nüviCam LMTHD is expected to be available in May of 2015 with a suggested retail price of $399.99. For more information, visit www.garmin.com/nuvi.